Common Core State Standards for Reading are divided into ten anchor standards. These are available in a regular version and in a second version for history/social studies, science and technical subjects. The wording for the anchor standards for each section is identical between the two versions, but the grade-level specifics for the regular version are different from the grade-level specifics for the version for technical subjects. In some states, agriculture instructors use the version for technical subjects. 1. Read closely to determine what the text says explicitly and to make logical inferences from it; cite specific textual evidence when writing or speaking to support conclusions drawn from the text. SEE EXAMPLE. 2. Determine central ideas or themes of a text and analyze their development; summarize the key supporting details and ideas. SEE EXAMPLE. 3. Analyze how and why individuals, events, or ideas develop and interact over the course of a text. SEE EXAMPLE. 4. Interpret words and phrases as they are used in a text, including determining technical, connotative, and figurative meanings, and analyze how specific word choices shape meaning or tone. SEE EXAMPLE. 5. Analyze the structure of texts, including how specific sentences, paragraphs, and larger portions of the text (e.g., a section, chapter, scene, or stanza) relate to each other and the whole. SEE EXAMPLE. 6. Assess how point of view or purpose shapes the content and style of a text. SEE EXAMPLE. 7. Integrate and evaluate content presented in diverse media and formats, including visually and quantitatively, as well as in words. SEE EXAMPLE. 8. Delineate and evaluate the argument and specific claims in a text, including the validity of the reasoning as well as the relevance and sufficiency of the evidence. SEE EXAMPLE. 9. Analyze how two or more texts address similar themes or topics in order to build knowledge or to compare the approaches the authors take. SEE EXAMPLE. 10. Read and comprehend complex literary and informational texts independently and proficiently. SEE EXAMPLE. Reading Anchor Standard 1. Read closely to determine what the text says explicitly and to make logical inferences from it; cite specific textual evidence when writing or speaking to support conclusions drawn from the text. AgEd Today is a daily summary of agriculture news. A news review worksheet serves as a tool encouraging students to read carefully and understand important details. The worksheet asks students to identify key elements, summarize main ideas, explain how the article affects them, and make comments about bias or information sources. Reading Anchor Standard 2. Determine central ideas or themes of a text and analyze their development; summarize the key supporting details and ideas. Exercise 3 for this lesson asks students to use a search engine to find one example of a medical treatment related to stem cells. They then complete a worksheet with specific details about the disease, treatment, medical professionals involved, cost, treatment, FDA approval and testimonials. The last question on the worksheet requires students to list one question or comment about what they read. Reading Anchor Standard 3. Analyze how and why individuals, events, or ideas develop and interact over the course of a text. Grade level 9-10, technical version: "Follow precisely a complex multistep procedure when carrying out experiments, taking measurements, or performing technical tasks attending to special cases or exceptions defined in the text." Grade level 11-12, technical version: "Follow precisely a complex multistep procedure when carrying out experiments, taking measurements, or performing technical tasks; analyze the specific results based on explanations in the text." Students learn some practical beginning welding tasks to gain arc welding experience in this lesson. The PowerPoint presents main ideas with additional photographs and drawings. To complete the welding exercises for this lesson, students must follow exercise directions and evaluate the results using a checklist. Reading Anchor Standard 4. Interpret words and phrases as they are used in a text, including determining technical, connotative, and figurative meanings, and analyze how specific word choices shape meaning or tone. Grades 9-12, technical version: "Determine the meaning of symbols, key terms, and other domain-specific words and phrases as they are used in a specific scientific or technical context relevant to [grade level] texts and topics." 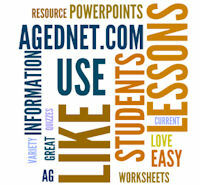 Students will use the AgEdNet.com search engine to find how the word "sustainable" is used in AgEdNet.com lessons. What it means depends in part on who is using it and what they are referring to. For example, an organic farmer might use sustainable to refer to organic production practices. A banker might look at an income and expense sheet and decide spending practices were not economically sustainable. A gardener in a dry Western state might choose native plants because they are more sustainable in their ability to tolerate dry conditions. Reading Anchor Standard 5. Analyze the structure of texts, including how specific sentences, paragraphs, and larger portions of the text (e.g., a section, chapter, scene, or stanza) relate to each other and the whole. Ask students to view this library as an online text, identifying the structure of the library as a whole, examining the way lessons are organized into smaller lesson units, and how lessons are further divided using subject headings. Students could be asked to find main organizational strategies (main idea, subheadings, internet resources, exercise pages, assessment questions, methods for learning vocabulary, etc.). An individual lesson could be compared to a Powerpoint to see what is included and what is left out of the shorter PowerPoint version. Reading Anchor Standard 6. Assess how point of view or purpose shapes the content and style of a text. IS111 Understanding "Animal Rights" Vs. "Animal Welfare"
This lesson covers the difference between "animal rights" and "animal welfare." It includes a large number of internet resources from opposing viewpoints. The PowerPoint reviews lesson concepts. The exercises require students to discuss the widely varying opinions on this topic. Reading Anchor Standard 7. Integrate and evaluate content presented in diverse media and formats, including visually and quantitatively, as well as in words. This lesson describes the purpose and content of the Dietary Guidelines for Americans. While the lesson uses mostly text, the PowerPoint summarizes the material and includes graphics and tables to reinforce the lesson ideas. In exercise 3, students research fast food meals and report how their calories and nutritional content compare with estimated calorie needs for male and female teenagers. Reading Anchor Standard 8. Delineate and evaluate the argument and specific claims in a text, including the validity of the reasoning as well as the relevance and sufficiency of the evidence. IS126 Are Genetically Modified Foods Safe To Eat? This lesson examines the debate over the safety of genetically modified (GM) food products. The lesson includes many internet resources on both sides of this issue. Students can read these recommended resources or find web sources on their own and evaluate the conclusions drawn by different groups and individuals. Reading Anchor Standard 9. Analyze how two or more texts address similar themes or topics in order to build knowledge or to compare the approaches the authors take. This lesson explores who decides how land is used, and how are those decisions made. The PowerPoint reviews main lesson ideas and includes graphics to support main points. For exercise #3, students explore one land use issue in their area or state, describe how it has affected land use in their area, and list at least three information sources. A class discussion may show that students draw different conclusions based on the information sources they used. Reading Anchor Standard 10. Read and comprehend complex literary and informational texts independently and proficiently. Have students read this introductory lesson on making career choices. Then have each student choose another lesson of their choice from the Ag Careers Library section on careers in specific agriculture fields. They should read the additional lesson and summarize the main ideas in writing or as part of a small group discussion. The anchor standards listed on this page are used by permission and are © Copyright 2010 National Governors Association Center for Best Practices and Council of Chief State School Officers. All rights reserved.